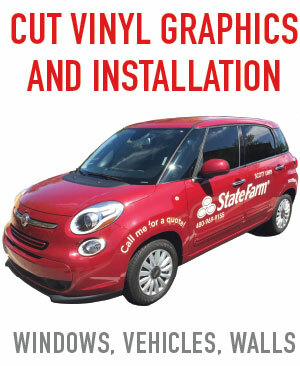 CUT ADHESIVE VINYL is best for signs, vehicle graphics, business window lettering, interior wall graphics and lettering, and decals. PRINT & CUT VINYL is best for small quantity color apparel or signs that requires cutting to a custom shape. CUT VINYL FOR HEAT PRESS is best for small quantity apparel orders, specialty glitter designs on shirts, team names and numbers on jerseys.